Home Cards that Move Happy Halloween!! Happy Halloween!! Here is another card that moves designed for Halloween. 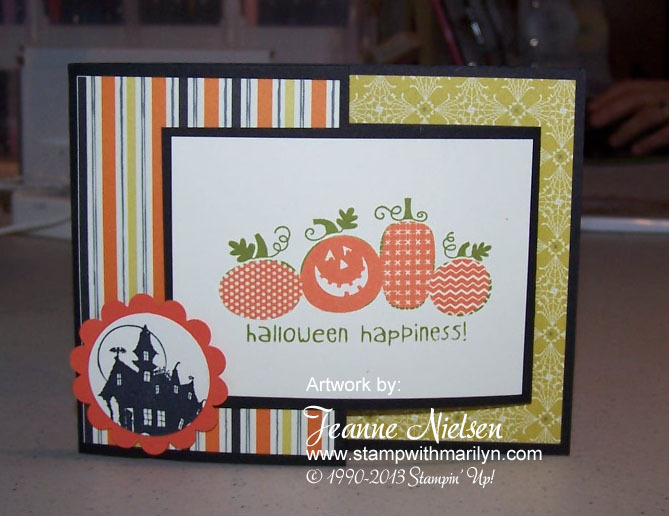 This card uses Halloween Happiness and the Best of Halloween stamp set. The Haunted House is one of my favorite Halloween stamps that SU has designed over the year!! The designer paper on this card is the Witch’s Brew design. 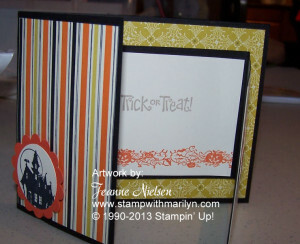 The card colors are basic black and tangerine tango card stocks. So to make the unique fold, use a card stock base that is cut the long way 4 1/4″ x 11″. Score at 5 1/2″ and fold in half. Cut 2 1/4″ off the top half of the card. Cut another piece of basic black card stock to 3″ x 8″. Score at 4″ and fold in half. Layer the bottom half of the smaller card onto the base of the larger card, folding in the opposite direction. With this card, the haunted house which is punched with a circle punch holds the layer closed! Enjoy your Halloween and don’t eat too much candy!! 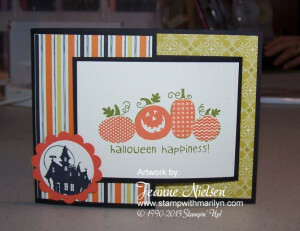 Halloween, handmade cards, Stampin' Up!. Bookmark.